Gambling is a global enterprise. Across the world, people and countries have different laws and as a result different gambling games on offer. While you can play roulette in Monaco and Las Vegas (with different difficulties because of regional rules) it’s illegal in Florida and completely off the table, however poker (conversely) is still available. However, one of the best examples of the split in gambling legality is Japan, where games for cash are illegal and casinos are banned, but what they have instead is a unique pinball styled game called Pachinko! Pachinko is probably best compared to pinball and evolved from the same early games into its current form. The first machines were built during the 1920’s and were initially for children, called the Corinth Game, which was in turn based on the game Bagatelle. The other game which inspired modern Pachinko was Billard Japonais or ‘Japanese Billiards’ which had a similar goal to Bagatelle of getting a ball past a series of pins and into a set hole. 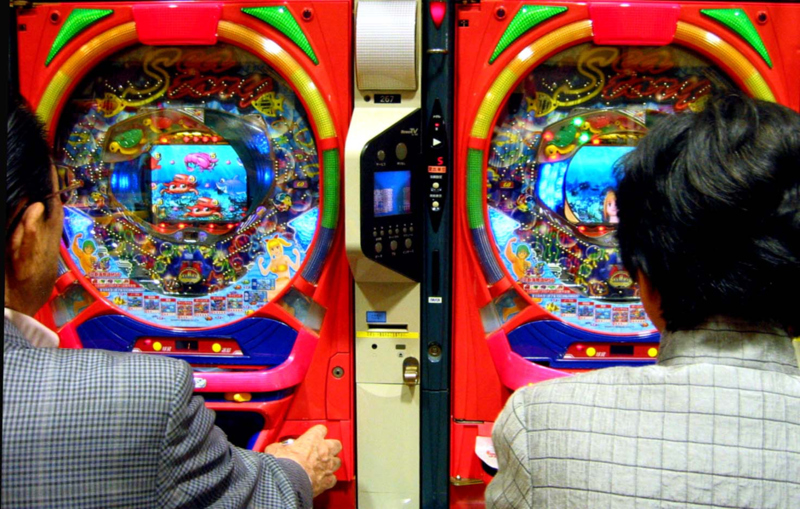 The nearest relative to Pachinko in the west is probably Pinball, with the same launching of a ball and trickle-down method but with wildly different goals. So, how do you play Pachinko? First, you have to buy some balls. Similar to Pinball, you insert cash and the machine releases a certain amount of balls to play with. But while Pinball gives you three large metal balls, Pachinko gives you dozens of smaller ones with a quantity over quality angle. From there, you launch the balls and watch as they bounce down the pins and tracks. While the goal in pinball is to keep the balls going with bumpers, in Pachinko you want the balls to fall down and land in a certain spot (around where the Gobble hole is on a conventional pinball machine) in order to trigger a jackpot. This causes the balls that you’d just been playing with to be passed through and dropped for you to collect them as your reward, similar to a slot machine. In recent years, Pachinko machines have been incorporating elements of slots called Pachislo in order to suitably randomise the amount you win in a jackpot. Interestingly, as you can’t gamble for cash in Japan the balls you win are technically not worth anything and can only be redeemed for prizes from the Pachinko Parlour. However, there is a standard procedure that once you’ve won the prizes you can ‘swap’ them for cash at a prize exchange parlour which is (normally) very, very close to the Pachinko Parlour itself. This legal loophole has been the matter of fierce discussion in Japanese politics with some wanting to relax casino gambling laws and some wanting to tighten them. The balls themselves are also somewhat regulated as each parlour has its own design in order to prevent people removing them and using them elsewhere or attempting to forge balls. Recently, there has been talk in Japan of loosening regulations but it’s unlikely Pachinko will be replaced by conventional casinos. The game occupies a unique space in Japanese culture as well as offering a different and interesting style of game for travelling gamblers!